The Tour is not only about the racers, but about all of the support work of the complete team. One rider will pull on the final Maillot Jaune in Paris, but every member of the team will be responsible for that accomplishment in 23 days time. It is stunning to watch the mechanics attempt to fix the bikes for riders as they drive along at nearly thirty miles per hour. All I can think of is how much it would hurt to get a finger in the spokes. Greg Van Avermaet (BMC) is getting a quick adjustment in the early stages of the first day of the Tour, it didn't work out. He later opted to switch bikes and then catch back up to the peloton and the job at hand. 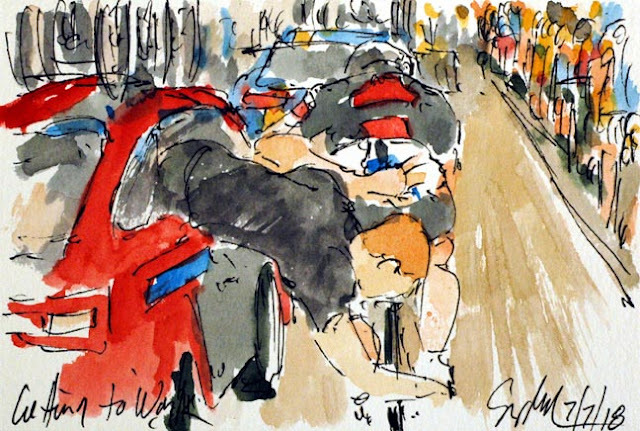 Hopefully, the mechanic will get to spend the rest of the stage inside of the team car. This is the painting that you can watch being created on my YouTube channel at https://www.youtube.com/channel/UCLGX-TnjXDSkkOidUE6pN1g. Unfortunately, I am still working out some kinks, so it is presented in three seperate videos. I hope to have that resolved for tomorrow's painting.